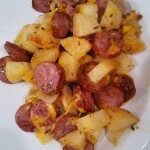 Oven Roasted Smoked Sausage and Potatoes are great anytime of the day. Roasted Smoked Sausage and Potatoes became a new favorite comfort food overnight. For this one we used a garlic smoked sausage from Stoysich Sausage, russet potatoes, and a yellow onion. Super simple with a really good flavor. 1) Preheat the oven to 400 F. Line a large deep walled baking sheet with foil, and drizzle with a bit of oil. Spread the oil out over the pan. Set aside. 2) Put the sausage slices, onions, and potatoes into a large bowl. Drizzle with remaining olive oil and season to taste with salt, pepper, paprika and dried thyme. Toss together with your hands until everything is thoroughly mixed and coated. Pour this out onto the baking tray, and spread it out as evenly as possible. 3) Place the baking sheet in the oven and roast for 45 minutes to an hour, stirring every 15 minutes or so, until the potatoes are golden brown and tender. Turn off the oven. Scatter the cheese over top of the cooked meat and potatoes, Put back into the oven for a few minutes to melt the cheese. Serve immediately. Oven Roasted Smoked Sausage and Potatoes. Now THAT’S comfort food. 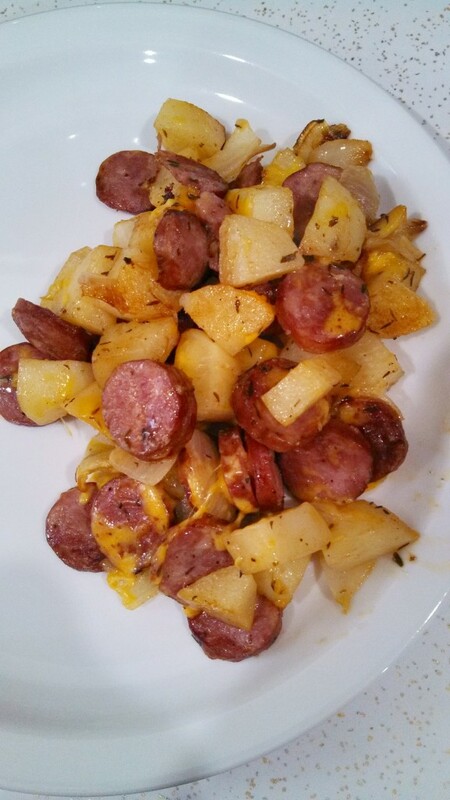 What do you get when you roast smoked sausage, potatoes, and onions, and cover it with cheddar cheese? Oven roasted smoked sausage and potatoes is a new comfort food. At least it is for us. Easy to make and really flavorful, this one is just the thing for a chilly night. You can use any brand of sausage that you like. 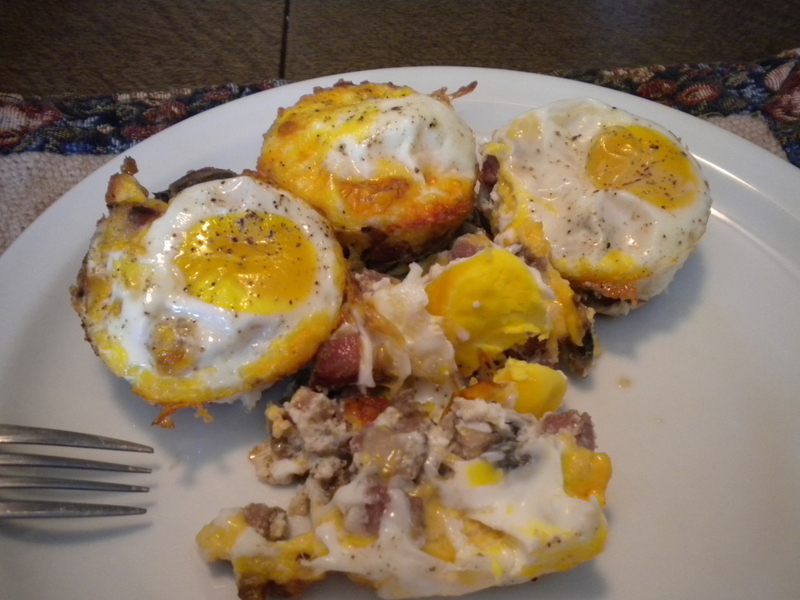 This recipe was created with sausage from Stoysich. I think this is going to be comfort food. This was really easy, flavorful and satisfying. 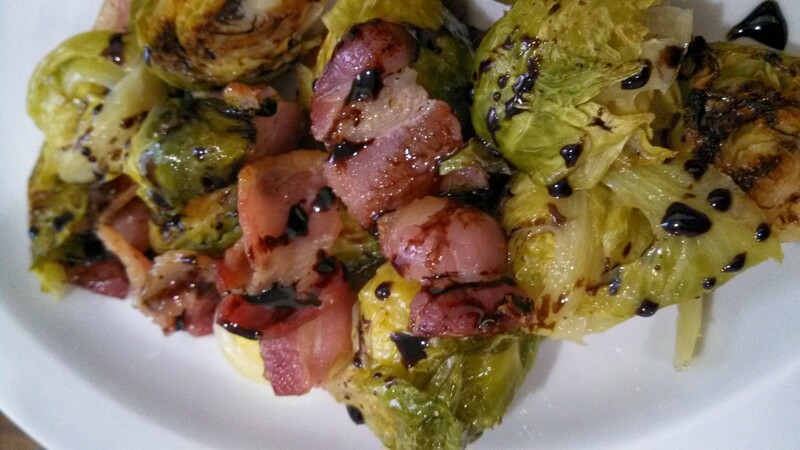 We made oven roasted Brussels sprouts with it and I can’t imagine a better pairing.